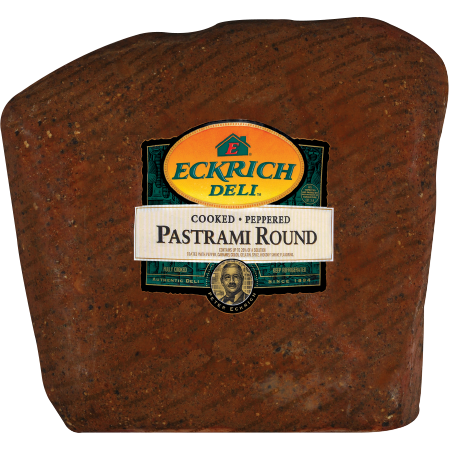 Eckrich Pastrami is peppered and seasoned with our signature blend, then cured and smoked for a traditional, rich pastrami taste. We do not use any by-products or artificial colors or flavors. We also make our deli meats free of fillers like soy or gluten. Get it sliced fresh at your deli and add rich flavor to any sandwich or appetizer platter. Ingredients: CURED WITH WATER, CONTAINS 2% OR LESS OF DEXTROSE, FLAVORINGS, SALT, SODIUM ERYTHORBATE, SODIUM NITRITE, SODIUM PHOSPHATE, SUGAR.